Whether your Christmas tree is real or fake, themed or a mish-mash, it’s an expression of you. We asked the staff at OTTAWA magazine about their trees: What’s on top of your tree? / What’s the best thing about your tree? Jane, art director: a vintage pink glass tree topper made in Germany / it’s a 30-year old tree I bought at White Rose. Each branch is individually placed into the trunk, allowing me to change the size and shape of the tree. It looks less perfect and more like a natural tree. 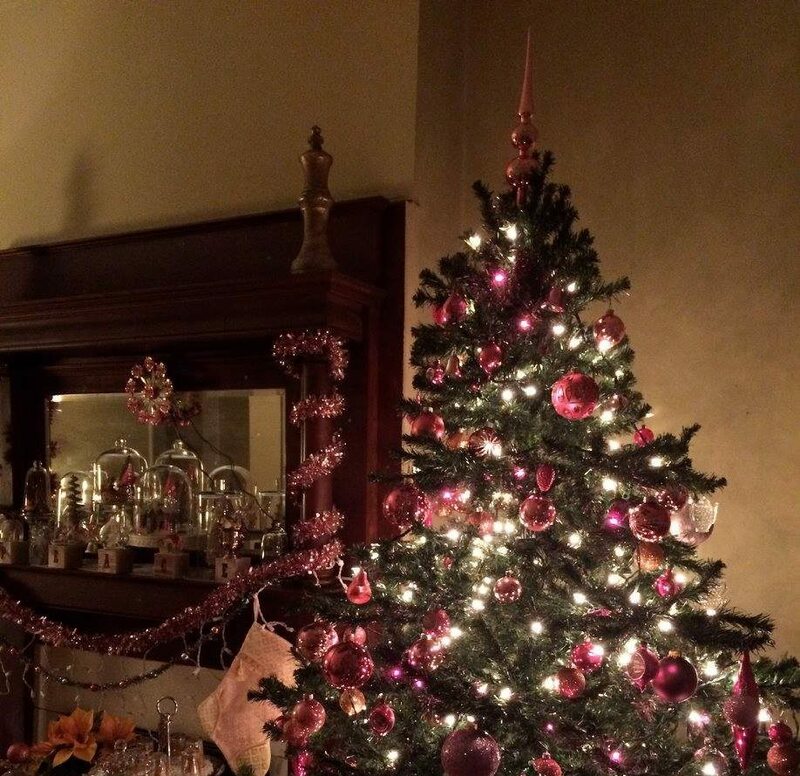 (The featured image is Jane’s pink tree this Christmas). Dianne, publisher: a star / the skirt under my tree is a green skirt I used to wear! Anna, sales: a brand new angel with lights (from Tinseltown) to replace my original lighted angel (33 years) that shorted out when last connected /crocheted stars from a friend’s mother who passed away. Dee, sales: a silver star / happy that we even have a tree; this is my (newly created) family’s first one (real, too! from a tree farm!) since we’re never home for Christmas. Julia, sales: an angel / that it’s real and the smell. Lisa, sales: a gold star / it gives our family an area to gather around talk and enjoy each other’s company. We often have the best chats when the lights are dim and the tree is lit. Kelsey, sales coordinator: a gold star! / our colour scheme of gold, blue and red makes it very elegant. With the Advent Calendar Giveaway over, we’d like to thank the local businesses who participated: Whalesbone Oyster House & Elmdale Oyster House, Absinthe, Fresco, Wall Space, Wicked Wanda’s, Ma Cuisine, Unrefined Olive, Signatures by Le Cordon Bleu, Brew Donkey, Brookstreet, Davidson’s Jewellers, Boogie + Birdie, Mags & Fags, Fauna, Holtz Spa, Soca, Kinki, Tulips & Maple, Brooks & Tom Designs, town. and Pierino Scarfo Salons. That was fun!